YouthServe Birmingham has 1500-2000 youth participating in its programs each year. Mostly, these youths are giving back to the community through volunteer work. In fact, even YouthServe’s summer camp program is about giving back, with some 80 campers each giving up to 45 hours of service to the city. That’s a lot of giving back. We can’t think of a better way to mentor youth than to have them do work that makes them feel a part of what makes their city great. Not to mention, YouthServe participants come from disparate backgrounds and have to learn how to work together for the good of the community. It’s not just about building community spirit, but also about building bridges, bringing a community together. This idea of civic action as youth and youth bridge builder is a brilliant one, and the reason we decided to give YouthServe Birmingham a small grant. Kars4Kids: Tell us about your Community Service Action Days. Is it difficult to get kids to sign up for things like trash pick-up? What motivates youth to sign up for these activities? Jennifer Hatchett: We have a variety of projects each month that range from hosting Halloween parties for homeless women and children to helping rebuild damaged nature centers, and yes, plenty of trash pick-up. Our goal for every event is to introduce youth volunteers to organizations meeting needs in their communities, but we also extend discussion to include systemic issues behind those needs. While extended discussions are not conducive to the service day/active volunteering format, we try to get enough in so that the youth there (from very different circumstances most days) are asking questions of themselves and digging deeper into their own communities. We also try to include plenty of time for these diverse youth to get to know each other. They make friends and often come back and serve together at several events. The camaraderie is essential to repeat service and often inspires taking the leap into larger leadership opportunities. Kars4Kids: Tell us about your Service Education program. What are students likely to learn in this school-based program? Jennifer Hatchett: Our service education program is conducted in-schools in 4, 8, and 12-session increments as selected by each class/school. The shorter sessions are more of an introduction to civic engagement – learning to identify resources and opportunities in their communities, find the gaps and discuss ways they might fill those gaps. The 8 and 12-session sets are for identifying service projects to address the specific gaps they identify and bringing those projects to completion. 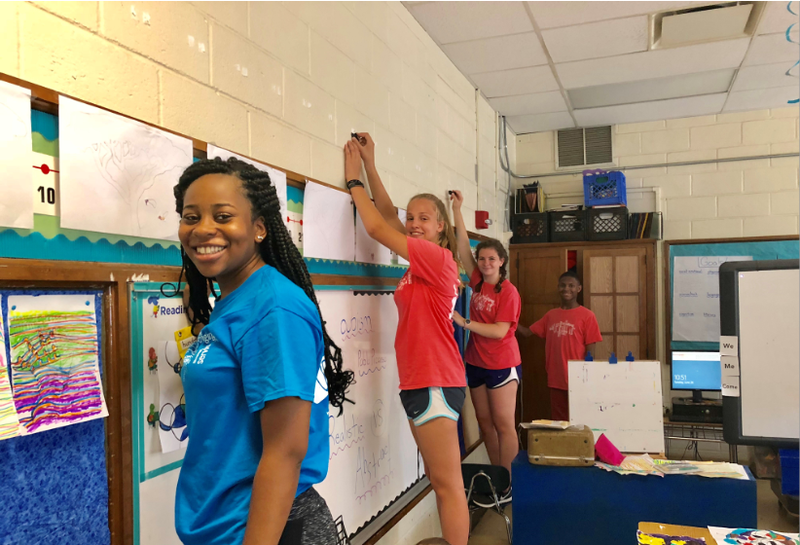 The longer, in-school programs resulting in hyper-local service is called “Changemaker Council” and is mostly not just an entire class, but students who have elected to participate in the program through either elective classes or student organizations like SGA. 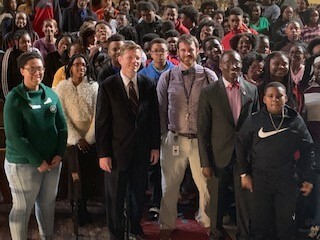 In-school YouthServe Birmingham program with 8th graders in a Birmingham City School (was a town-hall forum with elected leaders to explore use of land adjacent to their school. Kars4Kids: Your Urban Service Camp brings together youth from all walks of life to live together for one week. What kinds of activities do you offer at this camp? Jennifer Hatchett: The basic tenet of Urban Service Camp is to cram all YouthServe mission and scope into one intensive week. The above programs are woven into a week of workshops dealing with community, civic engagement, poverty and privilege, and systemic issues leading to things like lack of housing, food deserts, and health disparities. 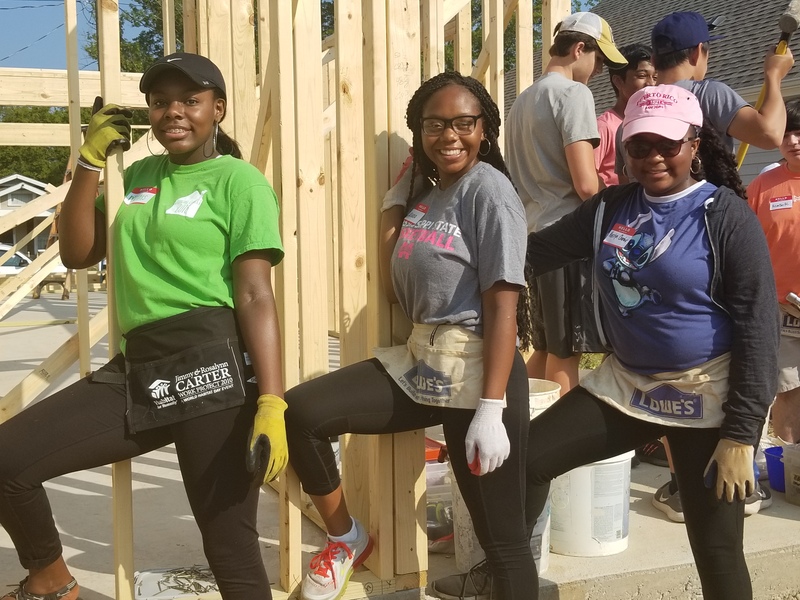 There are three days in all camps in which they youth spend serving on-site for places like Habitat for Humanity, local service organizations for those experiencing homelessness, neighborhoods with elderly and disabled residents who are unable to maintain their yards and houses, schools, mural projects, community and teaching farms, and more. They are exposed to very creative solutions to systemic issues (ie. Jones Valley Teaching Farm – an urban farm with locations at city schools where students learn to grow food, but also to market and sell it, and how to cook it) which leads discussion in their workshops. In addition to those more academic workshops, they do personal workshops to explore each other’s worlds, discover how they are different, but also how alike they are. At the end of camp, there are very close friendships existing that otherwise would never have come to pass. Youth who have never wanted for anything begin to understand the resourcefulness of families to struggle or live paycheck to paycheck. Youth who may not have any relatives attending college, after camp, have a network of people they know whose parents are in a position to help them navigate those waters. It is truly a beautiful thing to see each year and would give hope to the greatest cynics among us. Kars4Kids: Space in the Urban Service Camp is limited to 30 campers on a first-come, first-served basis. How many kids apply for this program? To what do you attribute its popularity? Jennifer Hatchett: We have room for as many as 30 for each camp, but truly 24 plus the 6 counselors is the most comfortable. With more campers, we have to put counselors on air mattresses throughout the gym. Last year, we were at capacity for all the camps, and not all who wanted to come were able to register. We attribute the popularity of this program to word of mouth. With so many youth talking about how ‘life-changing” the camp is, one can imagine its appeal to both youth and parents alike. Not only is the camp very affordable, it allows each camper to earn 45 service hours to start their school year. The leadership opportunities gained from the experience has lured many into a niche which has led them to college scholarships or access to colleges they would not have otherwise received. Kars4Kids: The Urban Service Camp places children from privileged backgrounds alongside children from lower income homes. Does conflict ever arise between participants as a result of these disparities? How would YouthServe deal with this sort of conflict? Jennifer Hatchett: Conflict is a strong word, as most of the interaction is in the mode of discovery. At the start of the camp, we go over the established rules of a “safe space,” how every opinion is valued and respect is of the essence. We have the most personal exchanges on the last night of camp through an exercise we do called “River Stories.” I have seen this exchange as the single most powerful part of camp, as the personal experiences of some can be very traumatic, or sometimes jarring to those who are unfamiliar to the challenges of those living in either extreme poverty or extreme wealth. They break into small groups and talk through it and support each other. It’s truly beautiful to watch. However, we do carefully cultivate the atmosphere of openness from the start to end, building on every day, organizing small groups as “families,” and team-building throughout. With all those things, it’s the service – working side by side together in the communities we serve – which breaks down the preconceived perceptions with which they may have arrived. 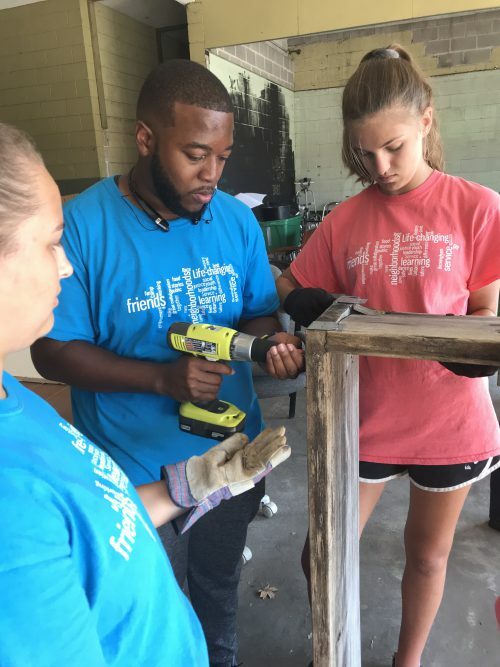 YouthServe campers working on construction project in downtown Ensley (blighted area of Birmingham) for Food Truck events with goal to foster business opportunities. Kars4Kids: What might be discussed at a typical Youth Action Council meeting? Jennifer Hatchett: A typical Youth Action Council meeting is focused on how to engage the many youths from a wide range of schools and neighborhoods into the next service events. They separate into committees to do things like connect with those registered to make sure they know where to go, register and welcome them when they arrive, and initiate ice-breaker games in order to get to know each other before the service commences. Often, a chair is elected for events as well to be responsible for connecting with the service sites and making sure all know their instructions. Also, outreach committees are established in order for YAC members to connect with registrants prior to any given service day to make sure they are coming and know where to go. Kars4Kids: Your Youth Philanthropy Council gives out $20,000 in grants each year. Isn’t that a lot of money to entrust to kids? What does sitting on this council teach young people? Jennifer Hatchett: Yes! And we are so grateful to the Joseph S. Bruno Charitable Foundation for providing the grant funding for this program, as youth philanthropy is a very important initiative of theirs and ours. For more than 20 years, teens have invested over a half million dollars in Birmingham organizations utilizing youth volunteers who address issues important to them. They are extremely organized and thorough, setting the funding focus each year and conducting site visits on their own. Ultimately, they learn how difficult it is to decide where a limited amount of money can go to make the largest and most lasting impact. Their perspectives are vital in the process, as so often funders who support programs for youth do not involve youth in the decision-making. Kars4Kids: How long has YouthServe been in operation? Are any of your board members or staff former participants in YouthServe? Jennifer Hatchett: YouthServe began as two separate organizations in 1998. They merged together in 2004. We are just now finding young professionals establishing themselves in their careers who were part of our programs to invite on the board. Our funding chair, Emily Schultz, was a member of one of the very first Youth Philanthropy Councils. Her experience with YouthServe inspired her studies and her career, which is in education policy. It is such a joy to hear her tell her story and how Youthserve impacted her as well as her brother, who also was among the early participants. It is our goal to continue to expand the percentage of the board comprised of these inspiring alumni. Kars4Kids: Have you gathered any statistics on YouthServe’s impact? Do you know how many participants graduate high school, or go on to college, for instance? Jennifer Hatchett: We try to keep tabs on as many youth as we can. In our last senior survey, of 11 graduating seniors in leadership, there were $3 million in scholarships offered and alumni were accepted to Harvard, Stanford, Yale, Georgetown, Vanderbilt, Spelman, Oglethorpe and more. One of our youth, who recently graduated from Harvard and currently works as a software engineer for Airbnb, contacted us over the holidays to add us to their charity accounts. He wrote a letter to us detailing how his experience changed his life and helped him immensely as a minority student entering a place like Harvard. Kars4Kids: What’s next for YouthServe? Jennifer Hatchett: We are in the process of documenting our in-school programs and developing interactive materials for students and volunteer leaders. With these new materials, we hope to replicate and expand the experience of YouthServe for more young people across our region and possibly beyond. We have big dreams!